This is the American Tourister Fieldbrook II 4 piece luggage set by, none other than American Tourister! American Tourister has been around since 1933 when Sol Koffler put everything he had on the line to build a luggage company. His dream was to sell suitcases for a dollar. Unfortunately American Tourister luggage doesn’t go for a dollar today but they are much more economical than most other luggage companies. This four piece luggage set we are reviewing today has its ups and downs but for the price it’s hard not to get your money’s worth. If you want the short version of this review scroll down to the bottom, otherwise take a look at what I think about this luggage set and check out possible alternatives that I’ve linked throughout the review as well. 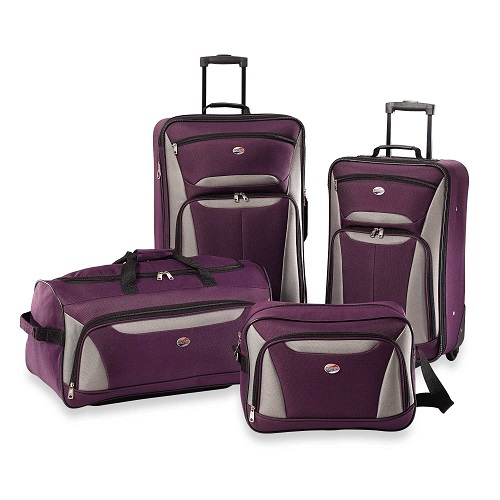 This American Tourister Fieldbrook II 4 piece set comes with a few colors to choose from but nothing extravagant. They offer this set in Black, Charcoal, Navy, Red and Purple. 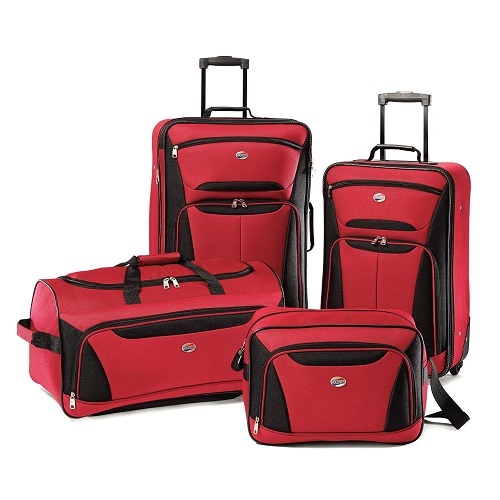 This 4 piece set is comprised of one large upright suitcase, a carry-on, a wheeled duffel bag and one boarding bag. If you are looking for a little less they also have the 3 piece set here. 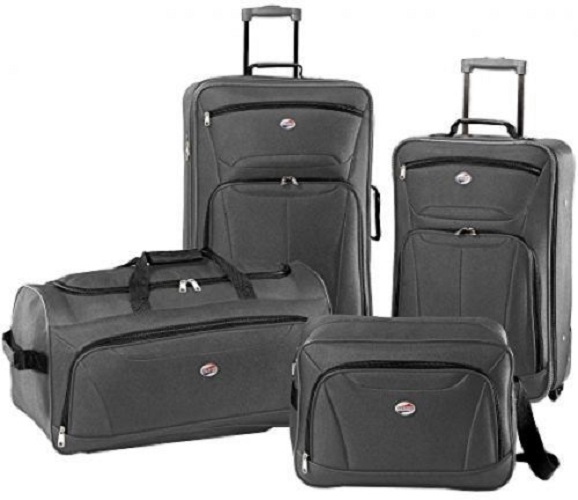 The design of this 4 piece Fieldbrook luggage set by American Tourister is pretty typical of what you would expect out of a standard luggage set. It is made from 100% polyester and has a fabric lining on the inside. Because it is made out of a soft fabric and not something hard like plastic, it is extremely light weight. 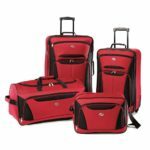 Unfortunately for those who like different colors than what was previously mentioned, they don’t offer any other colors like the Rockland luggage set does, which could prevent some people from considering this set. 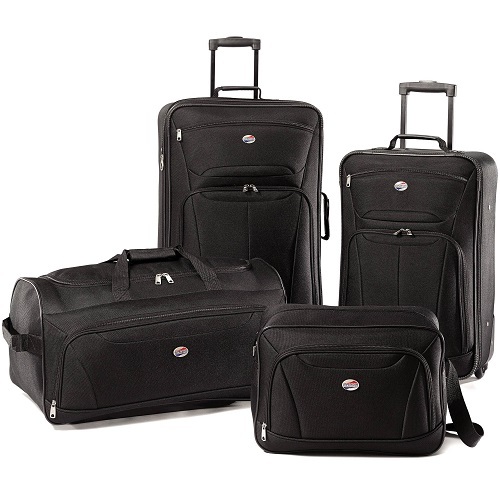 The American Tourister Fieldbrook II 4 piece set is pretty standard luggage in my book. There is nothing crazy about it and nothing bad in terms of design, it’s just very plain. The upside is the extremely appealing price for a four piece set, which is why I’m sure you’re reading this review. The American Tourister Fieldbrook set gets 4 out of 5 stars for style. Now if you’re looking at this 4 piece set and seriously considering it then you must be wondering how it can be so cheap. Well it’s no different than any other product line out there. The most popular brands will demand more of a markup on their prices while using virtually the same if not marginally better materials. 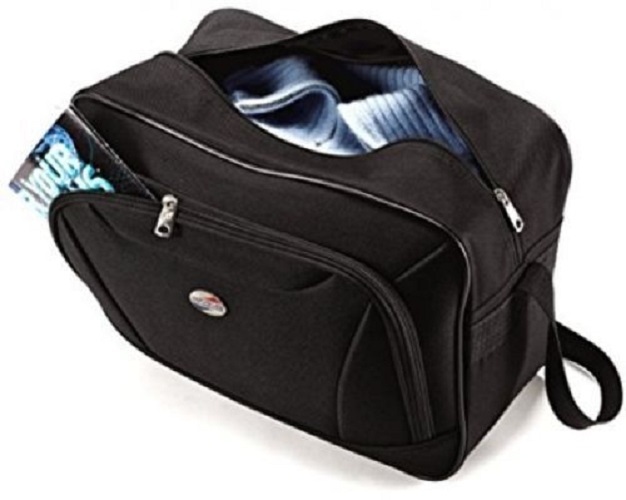 In this case the American Tourister Fieldbrook is about as good as any other luggage set available on the market. It’s not a big name player like Samsonite but it does use similar materials and can provide you with what you need for years to come. The Fieldbrook luggage set has been very durable while I’ve been using it and I have not seen any issues with quality or craftsmanship. To give you an idea, the American Tourister Fieldbrook is constructed with reinforced corners to protect during busy traffic times. This is great as I’m not gentle with my luggage at all. I would prefer it to hold up as well as my Samsonite Tread Lite but that’s in a class of its own. As mentioned earlier it is also extremely lightweight which helps reduce the stress on the handles of the bags which are very sturdy and hold up well. However, the wheels, although they’ve done a fine job, seem like over the long haul I might have trouble with them but that’s just me being paranoid. I noticed that the stitching on the inside of the luggage set isn’t well done and I feel like the lining can be easily ripped out. I’m already seeing lots of little strings but so far it’s held up for a weeklong vacation. The durability of the American Tourister Luggage Fieldbrook II 4 piece set is basically what you would expect from a luggage set this inexpensive. It holds up well under normal use but of course you will see some vulnerability that may give you an issue down the road. But honestly, at this price it’s hard not to get your monies worth. Overall the American Tourister Fieldbrook gets 4 out of 5 stars. Functionally the American Tourister Fieldbrook luggage set has provided some mixed results. It definitely gets the job done but I noticed right away there was an issue I had with this luggage set. To start the Fieldbrook luggage set has multiple exterior and interior pockets across each piece to help keep me organized. Once I’m on the road travelling I tend to get pretty sloppy with my luggage but this helps keep everything in its place. Of course it comes with a standard push button locking handle. This allows you to lock the handle in place so you can either pull or push by the handle with confidence that it won’t slide back down. Once you want to return the handle back into the bag just simply push down on the button. The tote bag comes with a smart sleeve which allows for easy travel with it. Basically all you do is use the sleeve on the back side of the tote to strap it over the extended luggage handle and you’re good to go! I noticed when I first received the Fieldbrook luggage set that it was actually smaller than I expected. It seems like it is more for a couple than a family and quite possibly even a single person who has to bring their whole wardrobe with them. If you want more space in your luggage then check out this 5 piece Newest luggage set for virtually the same price. Here are the dimensions of the 4 piece luggage set so you know exactly what you are getting. Another feature of the American Tourister luggage set that was somewhat disappointing has to do with the very bottom of the upright luggage bags. Unfortunately these uprights only come with two wheels and two feet, not four wheels. I know this is nitpicky but I like being able to roll it along all four wheels! Lastly the duffel bag has been both a pleasure to use and a pain. I like how they incorporated wheels on the duffel bag as well. Not something I’ve ever thought of. However, I don’t like how American Tourister did not add an extendable handle to the duffel bag so it makes it awkward to pull along. As you can see the functionality of the American Tourister Fieldbrook has its ups and downs. I like how it’s easy to keep everything organized with many different bag and extra pockets. However, I was concerned that it is quite small. Smaller than I anticipated but that’s alright because I’m used to packing just a carry-on, which allows my girlfriend to use the three other bags, and she will. Overall the functionality of the this luggage set gets 3 out 5 stars purely for the fact that most people will find this luggage set smaller than what they are expecting. The American Tourister Fieldbrook luggage set has scored well considering the inexpensive price tag. Usually with such a low price you would expect to see some compromises. And sure there are a few areas that could use some upgrades but I’m sure you will get your money’s worth out of this luggage set. So let me summarize what I liked and disliked about the Fieldbrook luggage set. The American Tourister Fieldbrook has color options outside of black. They do offer red, purple, charcoal and navy. The durability is strong with reinforced corners to be able to withstand rough handling. 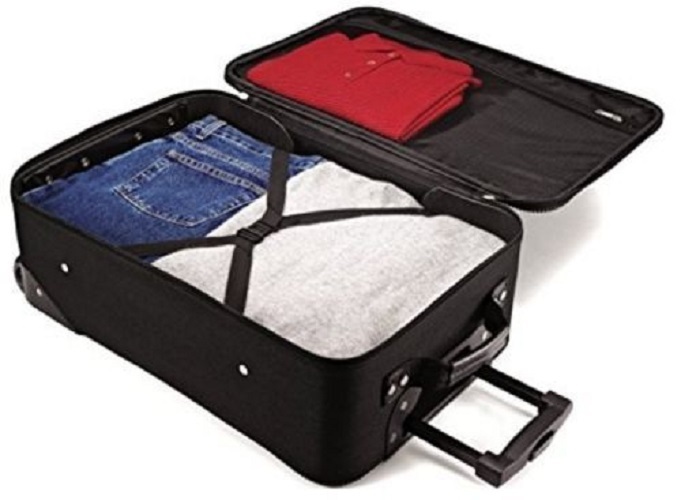 The handles are sturdy as well as the zippers and it doesn’t hurt that the American Tourister luggage set is lightweight to reduce the stress that is put on the handles. 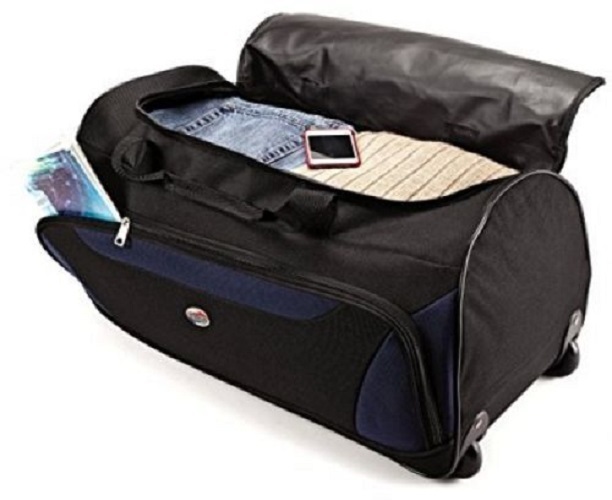 The extendable handles lock into place to allow you to pull or push the luggage with ease and you can simply push the button on the top of the handle to compress it back down into the bag. I enjoy the fact that this 4 piece luggage set has additional pockets; it keeps me organized, which I’m terrible at doing. A neat feature that is incredibly useful has to do with the smallest piece of luggage. The tote comes with a band on the back that allows you to strap it to one of the upright pieces of luggage so you don’t have to carry it separately. The duffel bag does come with its own set of wheels which is a neat feature which you don’t see on a duffel very often. Finally the price is too good to pass up and undoubtedly a reason you are considering this luggage set. You will get your money’s worth out of this set. While the American Tourister Fieldbrook luggage set does have a few color options, it does not have that many. Some people would prefer to express themselves more. The inner lining has some weak stitching and there are loose strings but again for the price you pay, I wouldn’t expect much more. The duffel bag does not have an extended handle so it can be a little awkward when trying to pull along. Along with the duffel bag the two upright suitcases only have two wheels and two feet. There are not four wheels on the bottom. Lastly the luggage is smaller than expected. It would suit a single person or a couple well but not a family. You would need to look elsewhere for more space. Ultimately the American Tourister luggage Fieldbrook II 4 piece set has quite a long name and decent marks for the inexpensive price. It is a perfect set for someone on a budget, a couple or a person who doesn’t travel frequently. Overall I give the American Tourister Fieldbrook luggage set 4 out of 5 stars! If you have a review of your own, feel free to leave it below!